Reading the Fantastic Four comics from the start. When we last saw our heroes, they ended up in an alternate universe after time-traveling, where they prevented a war. It appeared to be over, with the FF heading home, but in issue #345, we’re still not done time-traveling! 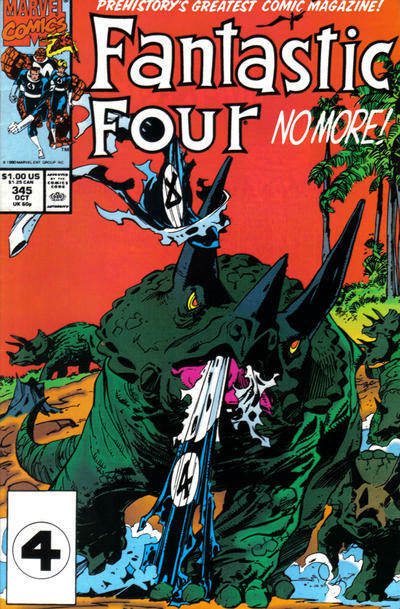 The issue begins with a bang, when the FF’s time sled breaks through the time barrier and crash lands in a jungle. Sharon is knocked unconscious and starts transforming from a Thing back into a human, and the rest of the team find their powers have stopped working. They’re surrounded by a group of U.S. soldiers who recently crash-landed on this island. Without their powers, the FF have a time convincing the soldiers they are who they say they are. The disagreement is interrupted by… a dinosaur! (It’s a spinosaurus, we later learn.) There’s a fight, in which Ben proves his worth by using the high-tech weapons from the time sled to take down the beast, after the soldiers’ guns can’t penetrate its hide. The soldiers and the FF make camp at the highest point of the island, a dormant volcano. While the others watch the dinosaurs from a distance, Ben and Sharon have a heart-to-heart. She’s having mixed feelings about being human again, but he assured her that he loves her no matter what she looks like. The next morning, more dinosaurs attack. The FF help themselves to the soldiers’ guns to help fight them off. There’s a weird bit where Reed strips down to his undies, using his FF uniform like a bullfighter’s flag to distract one of them. Ben dives into action wearing his Thing-shaped exoskeleton, handily fighting off the dinosaurs. Reed and the soldiers hatch a plan to convert the time sled into some sort of radio transmitter to call for help. On their way back to the sled, everyone discovers that half of the island has disappeared. Reed says the timestream is correcting itself, and if they don’t do something soon, the FF and the soldiers will end up in the age of the dinosaurs… permanently. Unstable molecule: Reed seems awfully quick to pick up the nearest gun and start shooting at the dinosaurs. Is this out if character or isn’t it? Fade out: Sue is shown performing first aid on one of the injured soldiers, and its accepted that this is just something that she can do. Clobberin’ time: This issue is a showcase for Ben, with him pretty much carrying the rest of the team, earning serious superhero cred without the need for his powers. Flame on: When Johnny’s powers don’t work, he makes an actual torch from the soldiers’ campfire to use as a weapon, what with him being an expert in fire and all. Fantastic fifth wheel: Remember that before she became a Thing, Sharon suffered some serious PTSD and was afraid to touch a man. Now that’s she’s human again and can touch an also-human Ben, she unsure of what that means. 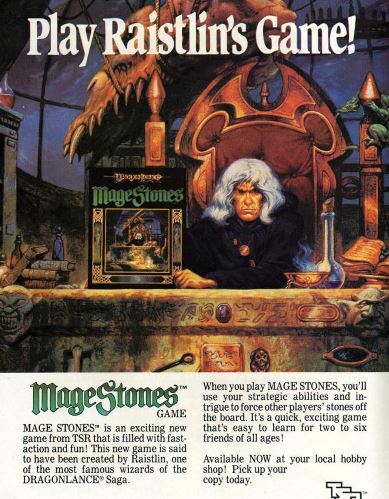 Commercial break: Remember when we all thought Raistlin was cool? Or is he still cool and I don’t know it? 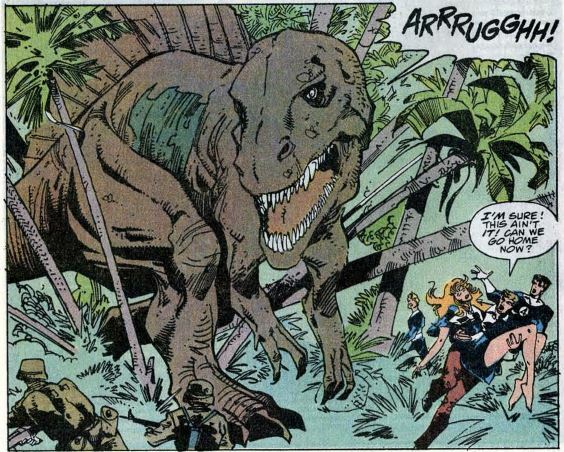 Trivia time: The Marvel Wiki has an entry on this island, naming it simply, “Dinosaur Island.” This story arc, however, is its only appearance. Fantastic or frightful? 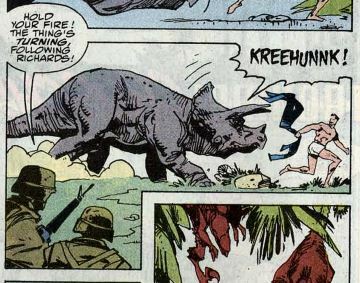 This story arc is often criticized for being nothing but an excuse for Walt Simonson to draw dinosaurs, but when he draws them as well as he does, why not? It’s a lot of fun, capturing the “we’re on an adventure” feeling of the best FF stories. Next week: We’ve got to get off this island, Wilson!